‘Kyla’s memory has been erased, her personality wiped blank, her memories lost for ever. Captivating, compelling and original. 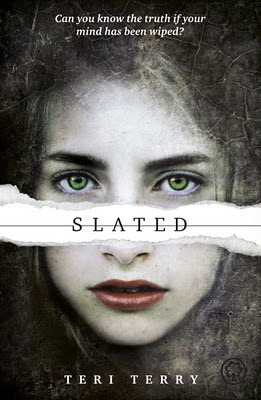 If I had to choose three words to sum up Slated, it would be those three. Kyla’s perspective of her world was unique and insightful, and I found the concept of being Slated really intriguing. Each Slated has a Levo, which is a device that looks a bit like a watch or bracelet and is fixed to their wrist. It monitors their levels; if they are happy their levels rise, and when they are sad, scared or angry, their levels drop. If their levels plunge too badly, Slateds can black out or even die. Any attempt to move or remove a Levo causes excruciating pain or death. The idea of Levos sent chills up my spine. I can’t imagine anything like it, and any attempt to on my behalf makes me shudder. Because of their Levos, Slateds are marked out and are treated like second class citizens. The world Kyla lives in is certainly fascinating, and it felt a bit like a utopian society until Kyla and her friend Ben started acting on their suspicions and digging around a bit. I can’t really say too much about the plot because it might spoil it a bit, but I thought it was utterly fantastic, and the twists and turns it took were, I thought, quite surprising at times. I only have one teeny weeny criticism for Slated. The dialogue at times felt a bit unrealistic and stunted the flow of the book a bit because of its formality. However, this could just be me and my preferences and the fact that most people speak very informally these days.